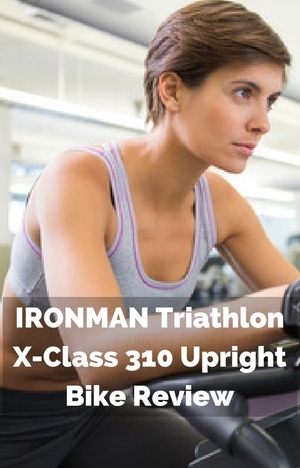 IRONMAN Triathlon X-Class 310 Upright Bike has a lot of features. And it comes at a price that is higher than many other upright exercise bikes. It also has the Ironman Triathlon name. Which builds expectations as to quality and strength of the bike. So it has a bit to live up to even before looking at the bike. The bike comes with pre-set programs, heart rate control programs to provide you with different training and challenges to help you keep on track as well as motivated. It also has a fan, speakers that add more convenience to your workouts. It can be adjusted to fit people of different heights plus it has a Fitness App and an account for better measures and tracking of performance. In my review I look at how well all these work together to give a low impact cardio workout and/or training in your home and who the bike is best for. To start, I look at how well it holds up as you exercise and train whether that is at high intensity through to less intense pace of getting started. The frame and stabilizer bars are made from steel that holds you steady as you workout at all intensities. With everything properly adjusted and tightened there should be no shaking or creaking to distract you from your workout nor from enjoying the TV or other media too. The end caps have levelers that can be used to level up the bike if the floor is uneven to prevent it from rocking from side to side. The warranty on the bike is a lifetime on the frame, 2 year on normal wearable parts and electronics and 5 years on labor and other parts. It’s very good on the frame and a reasonably good length for the price on the parts of the bike. The bike hasn’t been available too long so there isn’t any feedback from people who have been using the bike for longer period of times to gauge durability. The company say they have tested it for durability and endurance. Customers are impressed on the quality of construction. So it does seem this is a bike that should be one that you can get a lot of use out of for a number of years. The bike seat can be adjusted to fit individuals between the heights of 5ft 2 ins and 6 ft 4 ins. The horizontal movement helps to get yourself with a better fit in regards to the handlebars and pedals so that you’re not feeling cramped or over stretching. Being able to change the angle of the handlebars can help with that too. The adjustments need to be done off the bike. They are quick to do once you have properly fitted the bike to you the first time. The adjustments are made using a standard method of adjustment knob and pin that you loosen and pull to disengage pin so you can then move the seat to the height you want and then adjust slightly to insert pin in nearest hole in the pole and then tighten back up. If you are sharing the bike with others it just add seconds to getting on the bike if the seat has been moved since you last used it. So it doesn’t get in the way of a workout. To help to speed up the positioning you can mark the positions on the poles with permanent marker. The resistance level is displayed on the console and is also changed through it either manually by pushing the up/down buttons or by the program (which you can override if it is not to the level you want – up or down). It helps to keep you on track and can help to give you an objective idea of how hard you are working. The 32 levels of magnetic resistance give a wide range of resistance from easy to very hard catering for all abilities. The increases are incremental and move from each level is smooth without any sudden increases or decreases. It goes from very easy to hard to accommodate all levels of experience and fitness goals from beginners to those looking for more difficult challenges but won’t suit those who are looking for very tough hill climb workouts. The resistance operates very quietly and low maintenance as there are no touching parts. To keep the pedaling smoother at the higher levels you need to concentrate more on your form as the resistance will work more like a brake slowing the pedals otherwise you may start to have more of an up and down stroke that can add some impact to the pedal stroke. The console is powered by the house supply with the AC adaptor and cord supplied. It does mean if you don’t have power you can’t change the resistance. The bike has a flywheel and belt-drive provide a consistent and quiet pedaling operation, that is also low maintenance. This is enclosed in the shroud. This helps to protect you, children and pets from getting hurt by the moving parts. It also protect them from sweat and dirt that otherwise would get into the works and start corroding and jamming them up. The pedals are oversized with a measurement of 5 ins by 3 ins with a plastic strap that provides a good platform to push against and to hold feet in place. The strap is easy to adjust using a buckle rather means it isn’t tough to do. They are designed to be used with athletic shoes. The pedals are attached to a 3 piece crank that is strong and durable able to stand up to the rigors pushing against the resistance. It seems you can stand on the pedals as you might do with an indoor cycle although it probably won’t be as comfortable and shouldn’t be done for extended periods as you might do on one of those. The weight of the flywheel doesn’t pull the pedals through the same. as you get with spin bikes or indoor cycles. It’s not really designed for that type of workout. The Ironman Triathlon X-Class 510 Indoor Training Cycle is better for standing up on the pedals and those types of workouts. Seat. The bike has a comfortable Airsoft seat. It is well cushioned and is designed to provide support to all parts of the sit bones and to allow air to flow so they don’t get too hot when exercising for long periods. But you may still not like the seat and find yourself getting numb or feeling pain that takes away from the exercise or even makes it so you can’t complete your workout. This is the way with all exercise bike seats especially if you aren’t used to sitting on a bike seat. Sometimes it can be just a matter of persevering for a few weeks. But that is not always the case. You can try padded bike shorts or a gel seat cover to add some more comfort. And if you really don’t like the seat you can change it for any standard fitting bike seat that is more to your liking. Handlebars. The handlebars are fixed in place. The angle of them can’t be changed to make for a more comfortable position. The handlebars are covered for a better grip so you don’t slip. They are angled away and the ends bent upwards so you can grip and lean forward onto them. Although you may find this a bit hard on the arms if you do this for too long (they’re not padded). Dust and Dirt. The bike isn’t going to add to your cleaning chores too much. The biggest thing that needs cleaning up is sweat that is dropped on to the bike. Although the bike has protective features to reduce the corrosive effects of sweat it is still a good idea to wipe it down after a workout to keep it in looking good and performing at its best. It doesn’t take that long. If you put it on the rubber exercise mat it comes with that will provide protection for the floor. Noise. It operates very quietly. It makes hardly any noise at all. You can easily hear the TV without turning it up. You can use it anytime day or night without disturbing others even if they are sleeping – even children. You can use it when you want to – to fit into your life rather than the other way round. It makes it good for an apartment too – where your neighbors won’t know you are exercising and by putting the bike on the rubber exercise mat it will make doubly sure nothing is transmitted to apartment below. The bike is reasonably compact requiring an area of 21.5 by 41 ins for storing – you might fit it in a large closet but it is more likely to be stored in a corner or alongside a wall if you don’t want to or can’t leave it out ready for using. You do need some space round it when in use for safety reasons for you and so others can get around it easily. It is a good size for smaller homes and won’t be imposing if you use it in a living room or bedroom. To make it easier for one person to move around it has two transport wheels at the front. When you want to move it you tip the bike on to the wheels – these support most of the weight of the bike leaving you to navigate it around your home – it’s only a problem if you have tight corners to get the bike round or want to move it up or downstairs when you’ll have to lift it which will need two of you. The bike weighs 63 lbs. The wheels will work well on all but the softest surfaces where they may jam and you need to slide the bike. Also if you have a wood floor you might want to be careful to check that the wheels don’t scratch or dent it. The bike comes part completed with the most difficult part of it assembled – the drive and frame. It takes about 1 to 2 hours to complete but some can do it much quicker. If you have ever put together kitset furniture you’ll probably find this easier – there’s less parts and hardware. The instructions do a reasonable of describing the process although they do start with an overview drawing that might give you a scare where every part is shown and listed. You don’t have to do anything near that in putting it together. Going past that it becomes obvious it is relatively straightforward job. The tools needed are included. You are required to add the stabilizer bars, pedals, seat post, seat, front support post, handlebars, console and water bottle holder to the drive and frame. If you still don’t want to do this, it is possible to get it done for you in your home using Amazon’s service. It does cost extra and typically takes up to 2 hours. It seems people on the whole are pleased with the service. The angle of the console can be changed so you can watch it without having to crane or strain your neck – it can be tailored for your height and position while on the bike. The display screens are a good size and can seen easily from your seat and they are backlit so can be seen in any light conditions. The dual screens allow you to see your workout progress even when you have the top one covered with a tablet playing a video or displaying a kindle book as you can still see the lower one. The top screen shows your progress through a program with a series of columns representing a time segment and the height indicates the amount of resistance. It’s not the best looking display looking almost old fashioned but it is effective and simple to follow along to. The lower display shows time, distance, RPM, calories burned and heart rate when hand pulse sensors are held. When you sync the console with the App you get a better screen and easier to navigate around the options but it isn’t needed to use the bike effectively although you do need the free App to be able to record your workouts for you – otherwise the results need to be manually recorded. You don’t have to follow along to one of the programs if you don’t want to. You can go into the manual mode which you enter into by pressing the quick start button and not have to enter any other information. Or you can set targets for this of distance, time, calories and/or pulse. You then just pedal and adjust the resistance as you go. You can by pushing the up/down buttons to select one of the 12 pre-set programs – these work by adjusting the resistance for set time segments. Once you decide on the one you want to follow you can then set the target time you want. If the resistance isn’t at the level you want you can change that by pushing the up/down buttons to get to a level you want. It is possible to set up to 4 user profiles where you can enter gender, age, weight and height. This helps in giving better measures for calories burned, setting heart rate programs and also for tracking your results. You can also set up a customized workout program for each of the user profiles – where you can adjust the resistance level for a time segment. The standard workout time is 20 minutes. There are 4 heart rate control programs where it is your heart rate that determines whether the resistance should be increased or decreased. Using heart rate zones you can set them at 55%, 75% , 90% or you can select your own target heart rate. You can set up your target time for the program. There is a WATT program where you can set Watts and time. By pressing the recovery button on the console you can run a fitness test after you’ve completed your workout. You place your hands on the hand pulses sensors and the display counts down through 60 seconds. At the end it gives you a score from F1 to F6 with F1 being the fastest recovery time. To enable the bluetooth setting for use with the App is done via your smart device and connecting to the bike. The instruction manual is a bit skimpy on details about the computer and programs but it is enough to help you work out what you need to do to be able to use it – I think they are expecting you to have the App and use it with it more modern interface and usability. The plug in point for the power cable is at the bottom of the bike on the side which helps you to have the bike facing where you want rather than have it at the front which encourages you to have the bike facing the wall. To use the heart rate control programs and monitor your heart rate you need to be gripping the hand pulse sensors on the front part of the handlebars. You can’t move your hands when doing this otherwise it will break the signal. Not everyone is going to get these to work and some will find they only work intermittently at best. This is just the way these type of sensors and it doesn’t matter which bike you have. For the price of this bike I would have thought it would also be compatible with a heart rate strap to provide a more reliable way of getting your heart rate if you can’t get the hand pulse sensors to work. Even if you had to pay for it separately bikes around this range have this option. Rubber Mat. This is not something you get too often with an exercise bike. They can cost $29 for one – so it is a reasonable bonus. It can help with steadying the bike on uneven floors, protecting the floor from sweat and any small movement that could scratch it. Plus it can stop small vibrations being noticed if you are in an upstairs apartment. Water Bottle Holder. This is on the front support post about halfway down. It’s reachable without leaning forward too much. And you can grab it and replace it without having to slowdown much at all, even though you do need to slightly negotiate the console to do this. Speakers. There is an audio cable that is included that you use to plug your device into the console to use the speakers. The volume and program selection is controlled by the device and not by the console. Media Tray. The media shelf can fit tablets, MP3 players and other similarly sized devices. It holds them well so there should be no problems with them slipping off as you workout. The devices cover up the upper display. If you aren’t using the App you can still see some measures on the lower display below while you read or watch your device. The bike doesn’t have a charger to keep the devices charged while on the bike. Fitness App. The bike can be synced up with the IronFitness Pro App that is compatible with Android 2.2 and iOS 6 and up. You work with the App using bluetooth while on the bike which can be used to control the bike. It can start/stop the bike, adjust resistance levels, set goals, have readouts of workout performance, set goals and you can use it to manually record steps and weight. Feedback for the App is mixed but overtime it should improve and more features be added (hopefully). Fitness Account. You can use this account with your Fitness App for more analysis and recording to keep your measures as well as logging other activities. It doesn’t work with other Apps or fitness accounts to import or export information. There isn’t a feature for sharing with others on social media. Fan. The fan is one speed and you can change the direction of the air up and down using the louvers. The button to control this is above on the console. You may find that console blocks your view of the TV if you have the bike straight on to it but this can be overcome by angling the bike slightly you can get a good view of it. There isn’t too many customer reviews online at present. The current scoring from 12 reviews is that 84 % score the bike a 5. There are a couple who have had issues with the bike unfortunately. One person received a bike with a problem and Paradigm (supplier) hasn’t really helped themselves with lack of response. I have seen this on other products of theirs but also there have been people who have said how good they were are dealing with a problem – it does appear to me they do take customer service seriously but don’t always get it fully right. The other review is about the sizing saying it won’t fit them at 5 ft 5 ins which I think may be an issue of adjusting the bike properly rather than the bike itself. It’s not something mentioned by anyone else at this stage about the sizing of the bike and I’m surprised by this – I think if they were 5ft 2 ins then it might be possible there was problem with the fit due to a shorter leg length. Others have started they haven’t had an issue. Most people are generally very pleased with the quality of the bike for the price. They find it very sturdy, quiet and stand up to their workouts, They like the support, the challenge and variety they get with the workout programs. When I checked at Amazon on qualifying orders it was eligible for Prime and free shipping. The IRONMAN Triathlon X-Class 310 Upright Bike comes with a lot of good features that can be used by beginners and advanced users for their workouts and training. It is compact, quiet and can be easily moved around. It can fit easily in most homes without causing problems that make it more trouble than it’s worth. Although you can stand on the pedals it’s not really as good for this as a spin bike or indoor cycle you may find the workout isn’t as intense as you get with these. It doesn’t have the heavy weighted flywheel like those that help your pedaling motion. The other area I’d like to see it improve is the heart rate monitoring it uses hand pulse sensors rather than heart rate strap which is more reliable than the sensors. These aside this is a sturdy upright exercise bike that multiple people of a variety of levels of fitness can use to achieve their fitness goals from getting started, weight loss, toning up or to get in some serious indoor training.